We encourage you to create Habitat for Humanity societies at universities. Such a society was created last year at the Warsaw University of Technology and it was named SPOT. We encourage to join this group or establish similar volunteering groups, who work together at their university and support the mission of Habitat for Humanity. 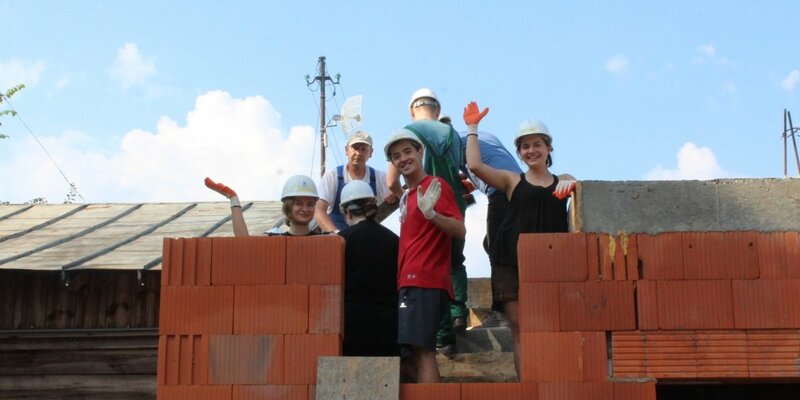 If you would like to found a student volunteering group, contact us by email (wolontariat@habitat.pl). SPOT is a country-wide architectural and construction initiative established thanks to the help from Habitat for Humanity Poland. It connects young people associated with these industries. It is a platform for exchanging ideas and encouraging to act together. Most of all, SPOT is a meeting of young people in the natural habitat of their future professional lives, where in a practical manner they have an opportunity to learn to cooperate across the industries and simultaneously experience social work through architecture made for people. The first joint challenge was participation in the project of expanding the house of Mrs. Agata and Mr. Miroslaw, which we work on since April 2017 in Redzyńskie near Warsaw. Members of SPOT supported us at the construction site twice – they organized two events ‘SPOTkajmy sie w Redzyńskiem!’ and ‘MiniSPOT’. Apart from participating in the construction, they also prepared a number of meetings, discussions and workshops with specialists from various industries connected with housing. More information about SPOT can be found on its Facebook profile.